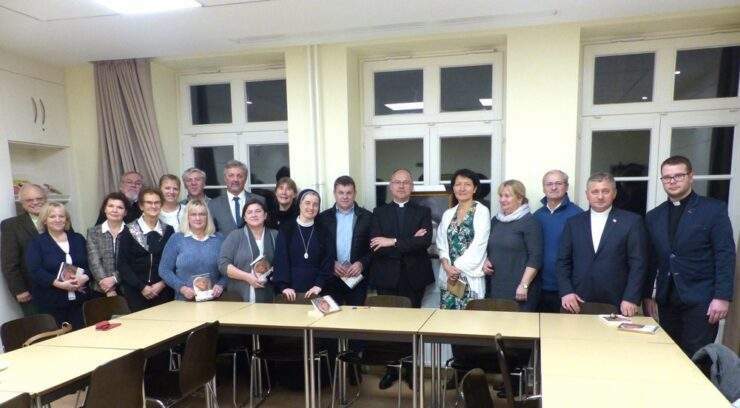 On Saturday, November 10, 2018, in the parish hall of the Polish Catholic Mission in Hamburg, as part of the Papal Day celebrations, there was a meeting of friends of the John Paul II Foundation with Msgr. Sławomir Oder, postulator of the beatification and canonization of St. John Paul II, who came from Rome. After the prayer and welcoming all attendees of the meeting, the Pastor of the mission, Rev. Canon dr Jacek Bystron presented the venerable Guest from Rome, emphasizing his close relationship with the Diocese of Pelpin. Then, Msgr. Sławomir Oder in informal and warm words spoke about his meetings with St. John Paul II, and on the canvas of this he accented the theological virtues of the Polish Pope. He told us about the life of John Paul II; His simplicity, deepness, and boundless commitment in everything what He was doing. Msgr. Oder presented also the facts from the beatification and canonization processes, the inexplicable healing through the intercession of John Paul II, which led to the rapid completion of the process. After that, all participants had the opportunity to ask questions about the work of the Postulator. Msgr. Oder reviled that it was an amazing grace that he was able to participate in the beatification and canonization process of John Paul II. The time of the process and research was like years long retreat. After answering all questions, our guest was signing his book “I remained with you. Arcana of the John Paul II’s canonization process “. At the end all lined up for a photograph.